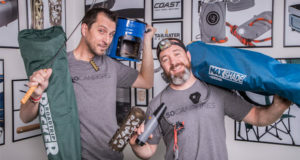 To make yours the envy of every other site in the campground, once again 50 Campfires ran the weekly Amp Your Camp giveaway, presented by Coast and Zip. We even extended Amp Your Camp this year, giving everyone an extra week to win. 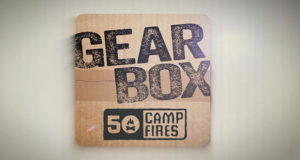 That means for 10 weeks 50 Campfires awarded prize packages worth more than $500! 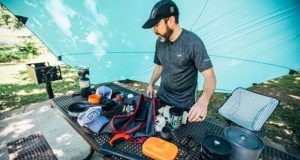 In our Amp Your Camp giveaway we gave away some powerful headlamps to brighten your nights at the campsite, fire starters to get your campsite cooking faster than any other, popup privacy shelters for showering or … you know … just about anywhere. Other Amp Your Camp gear included sleeping bags, tents, apparel, food, eating utensils, camping lanterns, food, water filters, fire lighters, pet products and more. 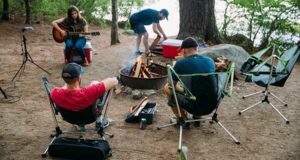 Checkout the photos of some of our Amp Your Camp winners from this year and read what a few of them had to say about their new camping gear! The timing of this great prize could not have been more perfect. My granddaughter is leaving Texas Friday for a week long off-road and hiking trek in Colorado to finish her summer freedom before heading back to college. She could not believe her eyes when she saw the super items I had received. 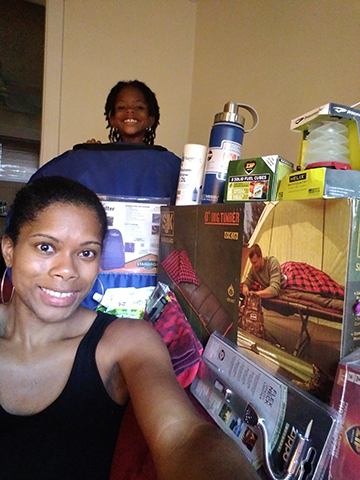 I offered her the use of anything she needed and it was like Christmas for her! 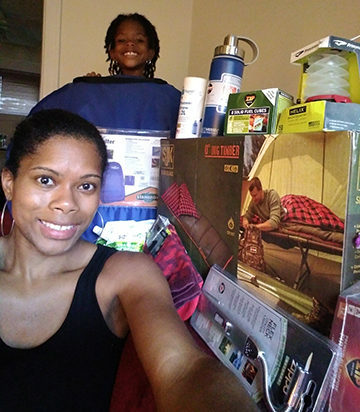 She took everything but the Pop up Privacy Shelter and the socks (she will have a loaded jeep when she leaves), and was so happy to have some things she would have otherwise had to purchase. 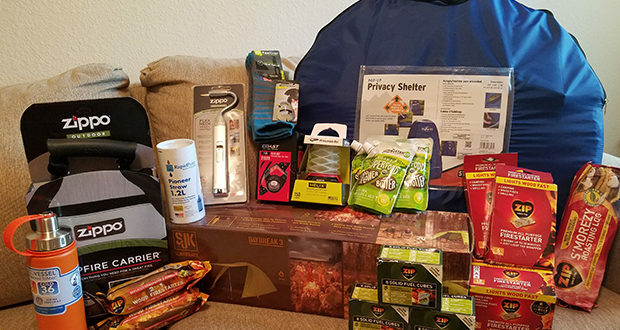 I can’t thank you enough for the opportunity to participate in the 50 Campfires giveaway, every item will be put to good use and 50 Campfires will be thought of each time. 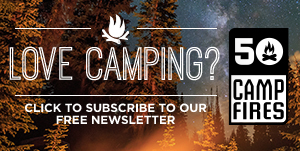 The magazine is great and I will be keeping up with it and learning more about camping (the tips are great). Please thank your great sponsors for their contributions to the contest and let them know they are appreciated. 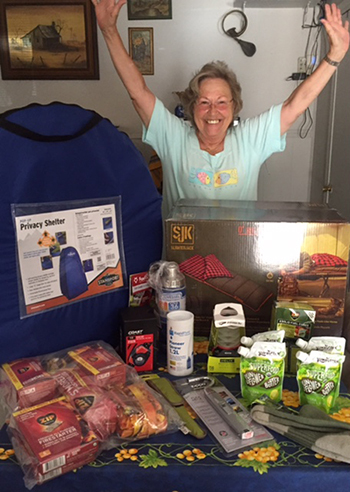 I got my fabulous camping gear from the Amp Your Camp sweeps today and I am beyond thrilled! 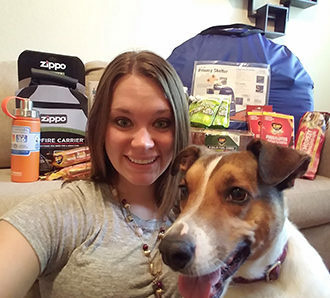 My husband, myself, and our favorite camping buddy (our dog Sam) cannot wait to try out some of our new gear in the next few weeks. I just had to include a picture with the dog, as he truly loves camping. 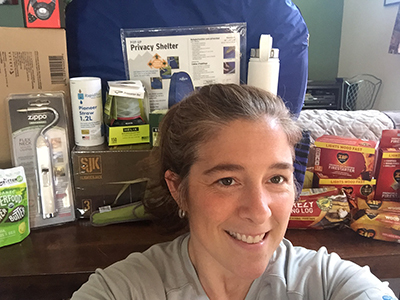 Update a few weeks later: We went camping this weekend and here is my update – my favorite items are the headlamp and the lantern. They were both brighter than any light I have bought previously. I used the fire wood carrier also, which helped to free up a hand so I could carry multiple items. I also used the bamboo utensils. I liked the utensils because it felt like I was just eating a meal at home since the utensils are so durable, just like real silverware. I will keep using new items as we continue camping. I have a 3 and 5 year old to take camping this year. This stuff is great! 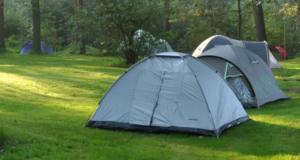 I attached two photos of the Slumberjack Daybreak 3 tent we won. We were able to fit in our mattress since we didn’t take our dogs with us. It was easy to put up since everything is color-coded. We also use the Coast FL85 Headlamp all the time. One of the places we camp has no electricity so absolutely no light. The headlamp is amazing out there. We have also used the Zippo Flex Neck Utility Lighter regularly. My husband loves using it to get the campfire going. The long neck keeps him from using his small lighter and burning his fingers. 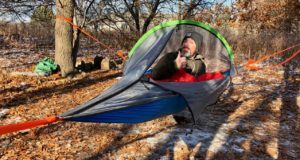 The Princeton Tec Helix Backcountry light has been used multiple times to hang in a shelter and my husband uses it when he car camps. 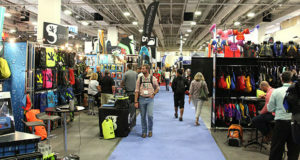 We can’t wait to bring out our other prizes as the weather cools off and we camp a little more often. 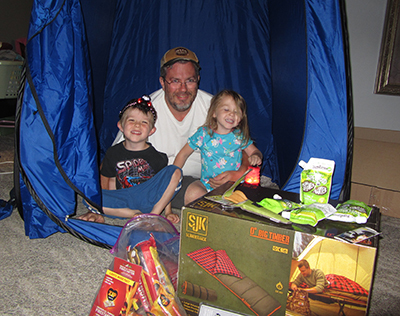 My family and I love the 50 Campfires package. We received the package hours before leaving for Yellowstone National Park. The socks and the coast headlamp quickly made it into the bag. There is nothing like a good pair of socks for long hiking trips. The headlamp is extremely bright. 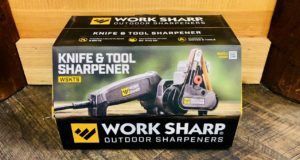 The other items will be headed to Lake George for an annual camping trip. We have camped with our children for over twelve years and this will be the first time I have had my own sleeping bag (my girls were secretly hoping they would get their own tent). 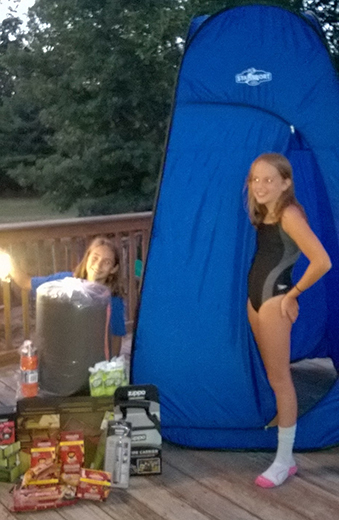 As far as the product I think will get the most use, is the privacy-changing tent. I have swimmers and they always need a place to change. 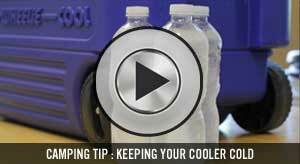 It pops up quickly and is easy to put away. Thank you so much. Your sponsors were very generous. This is a picture of my girls who set everything up themselves. It was like Christmas in July! Thank you so much! 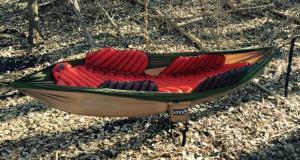 What great fun stuff for camping. I want to teach my daughter about the great outdoors, and all of nature’s beauty. She has already claimed the Helix lamp is hers. 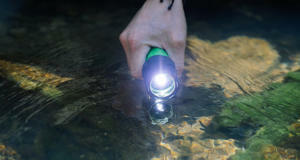 The Coast headlamp is incredibly bright! 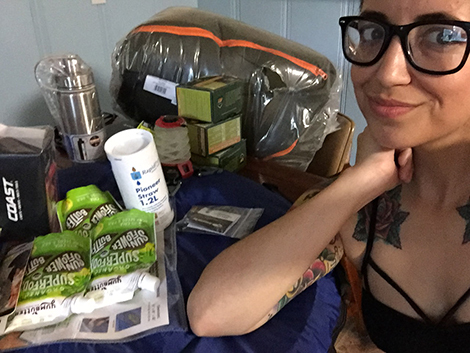 This stuff is going to make camping a breeze. I’m so grateful for these gifts.